With a successful 2007 behind, the Philippine Department of Tourism (PDOT) is positioning to introduce new destinations to the Korean market. 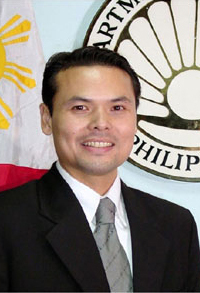 Secretary Joseph Ace Durano of Philippine Tourism Department. On the occasion of the Philippine-Korea Travel Exchange (PHILKOTEX), slated for March 13, 2008, which is Pdot's second foray directly targeting Korean travel agents,Tourism Secretary Joseph Ace Durano has issued his warm welcome message to members of a high-powered Korean travel trade delegation and media representatives. "It is with both pride and pleasure that I welcome our Korean partners to the 2nd Philippine-Korea Travel Exchange,"he said thanking Korean travel industry stakeholders for their participation and varying degree of sponsorship in making this travel event a reality. TRAVEX, the event's primary component, will continue to be window of tourism business opportunities for valued guests from Korea, he said. "The best of our 7107 islands are represented in this forum, confident in impressing you with a wide array of options filled with breathtaking scenarios, cultural attractions, natural wonders and unique activities, topped by the unrivalled warmth of the Filipino," Secretary Durano said. He then said that new for this 2nd edition of PHILKOTEXT are the offbeat of destinations and adventuress being offered the Korean Buyers for the post-conference tours. Dumaguete, Bohol, Palawan, Davao, Banaue and Subic are being highlighted for the range of activities and new package available, aimed at expanding the Korean operators' tour program, he added. In the meantime, Ms Maricon Basco-Ebron, tourism director and attaché at the Philippine Embassy in Korea, said that complementing the business appointments with Philippine tourism sellers are familiarization programs of destinations new to the Korean travel industry. Tagged Discover the Hidden North is a four-day road trip of picturesque coastlines and mountain sceneries. From Pangasinan, home of the Hundred Islands, to Banaue, the heart of rice terrace country, the road trip promises hours of country view. Promising an experience of provincial life, the group will tour the unexplored coves and islets lapped in the waters of Lingayen Gulf. Ms Maricon Basco-Ebron, tourism director and attache at the Philippine Embassy in Seoul..
After an overnight stay, the early ten-hour ride will culminate at the famed Philippine highlands site – Banaue. The highlight will be a visit to Banga-an, a tribal village nestled 1300m above sea level providing a panoramic view of the rice terraces. Touted as one of the great icons of the country and reputed as the "8th Wonder of the World," the terraces were dangerously hewn from the steep terrain 2000 years ago by Ifugao tribes using primitive tools. Extremely Hot Bicol is activity laden – wakeboarding, wakeskating, wall climbing, whaleshark encounter and firefly watching. Tampered only with the sampling of spicy Bicolano dishes at stops along the way, the tour assures a mix of extreme sports, historical walks and an encounter with the world's biggest fish. Camsur Watersports Complex, a unique water sports park designed for water-based extreme activities will be the group's paramount experience for the 1st day. A walk through the ruins of Cagsawa Church follows, offering the majestic view of Mt. Mayon with its nearly perfect cone. Refreshing Bohol offers snorkeling at one of the country's premier sites for diving, Balicasag Island, raffia making and organic garden experience at the Bee Farm. Balicasag Island Dive Resort, a Philippine Tourism Authority property, lies in the comfort of the marine sanctuary. Schools of jacks swirling in the thousands, hundreds of barracudas swimming side-by-side, occasional sightings of whalesharks and abundant varieties of extremely colorful tropical fishes mark the coral seascape of this island. Bohol offers rural riverside life during the Loboc River cruise with lunch. The world's smallest primate, the tarsier, and the famed dome-shaped Chocolate hills are additional treats to the historical markers and fortress-like churches of the countryside tour. In Discover our Shores: Dumaguete, guests are immediately taken to sample the underwater wonders of Apo Island, acclaimed as having the planet's widest variety of coral and fish species. Picnic lunch goes with the snorkeling/diving sojourn before returning to the city for a quick resort inspection and rolling tour concluded by a sunset dinner at Rizal Boulevard. An excursion to Sumilon Island the next day provides a sampling of the 12-Casita resort's amenities to include a dip by the famous sandbar, kayaking in the lagoon and/or an invigorating hike around the island. The afternoon offers an introductory tour of Dumaguete to see its historical landmarks as well as observe lacquer making at Negros Oriental Arts and Heritage (NOAH). Similarly, Last Frontier Palawan kicks off with an island stay and snorkeling session at Dos Palmas Resort where biking and kayaking are the alternative activities. Nighttime brings the group to a singing contest at the resort's nore bang or a pingpong competition within the pavilion. A whole day tour of UNICEF's Natural World Heritage Site, the St. Paul Subterranean River, is in store for the guests the following day capped with a seafood dinner at a famous coastal restaurant upon their return to the capital. 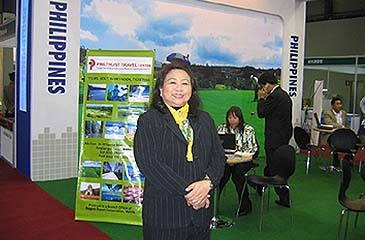 Nature remains the key element in promoting the Philippines. Nature Encounter Subic brings guests to Puning Resort to sample the unique treatments of its spa, before reaching the recreational haven for a taste of its nightlife. The Jungle Environment Survival Training (JEST) starts the second day activities, where instructors of US Special Forces and Navy Seals will demonstrate techniques on jungle survival. At the edge of the Subic Rainforest lies Ocean Adventure, an open-water marine park that offers encounters with marine mammals as well as aquariums of tropical fishes in a learning environment. Also, the Zoobic Safari is an educational visit to witness land animals in a more open and less restricted condition. Likewise, a resort welcomes the travel agents and media representatives taking the Unwind in the Abundance of Nature – Davao. The group immediately proceeds to Pearl Farm Resort for an overnight stay after the special Kadayawan dance greeting at the airport and the mouth-watering seafood lunch. True to Davao's tagline "From Islands to Highlands," the tour takes them to Eden Mountain Resort the next day for a panoramic view of the city at an elevation of 2,500 meters. After the resort lunch that includes the freshest garden salads, the group heads off to the Orchid Garden. A separate day option is available for adventure seekers in the group. About 2 hours from the city proper, the adrenaline junkies are taken to a mountainous area for the invigorating activity of whitewater rafting. The program includes the packed-lunch taken in a calm area along the river during one of the breaks, and a photo CD of the entire day's action captured by a kayaking coordinator. The day culminates with a delectable dinner at Jack's Ridge where the region's grilled specialties are served.